The Aga Khan University is organizing an Open Day for Potential Candidates who are willing to apply for admission in the Programmes at AKU. 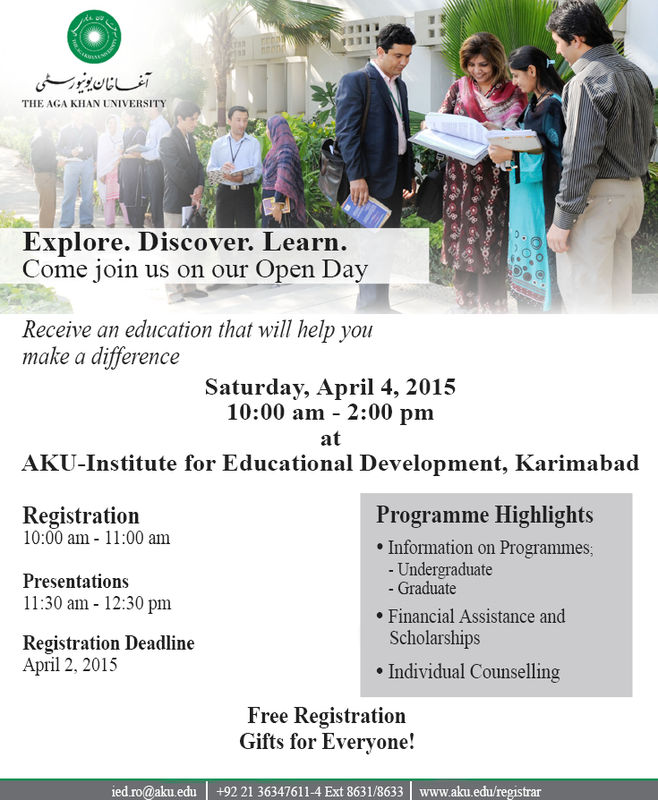 The Open Day will be held on Saturday, April 4, 2015 from 10:00 am to 2:00 pm at AKU – Institute for Educational Development (Karimabad Campus). Please get yourself registered for ‘Open Day’ by April 2, 2015. Kindly refer to the below flyer for further details. Ms Shela Hirani has done Master of Science in Nursing (MScN), Advanced Diploma in Early Child Development and Bachelor of Science in Nursing from the Aga Khan University. She has been conducting training sessions at the hospital and diverse community setups. Her area of specialty is Maternal and Child Health with the focus on “Early child development” and “Human lactation”. Her several papers have been published in the refereed journals pertinent to the theme of maternal and child health in Pakistani context. Currently, she is working as Assistant Professor at Aga Khan University, School of Nursing and Midwifery (AKU-SONAM). She also chairs Child Health Nursing Interest group at Aga Khan University, and serving as President of the Rho Delta Chapter, Sigma Theta Tau International: An honor society of nursing. Kindly confirm your participation latest by Thursday, April 2, 2015, at registration@ptan.org or (36826991-4/36347611 Ext. 8554 / 8556), as this will facilitate us in organizing the workshop effectively. On behalf of APEE Executive Committee, we would like to invite you for the academic session to be held on Saturday, March 28, 2015. What appears to be missing from many schools and society at large is a shared vocabulary, based on shared positive human values, which can provide a sense of direction and vision about how to create a stable moral society. Values are principles fundamental, convictions, ideals, standards or life stances that act as general guides to behavior or as reference points in decision making. Value education is most effective when the Principal acts as a role model and ensure that it is at the heart of the school’s philosophy. - Decide why do you want to introduce Value-based education and what is it about? - What positive values should a school promote? - How do Values inculcate in curriculum? - Do schools have enough time to introduce values? Ms Shahnila Sami is a Senior Academic Advisor at Danesh Publication. She holds an MPhil degree in Education. 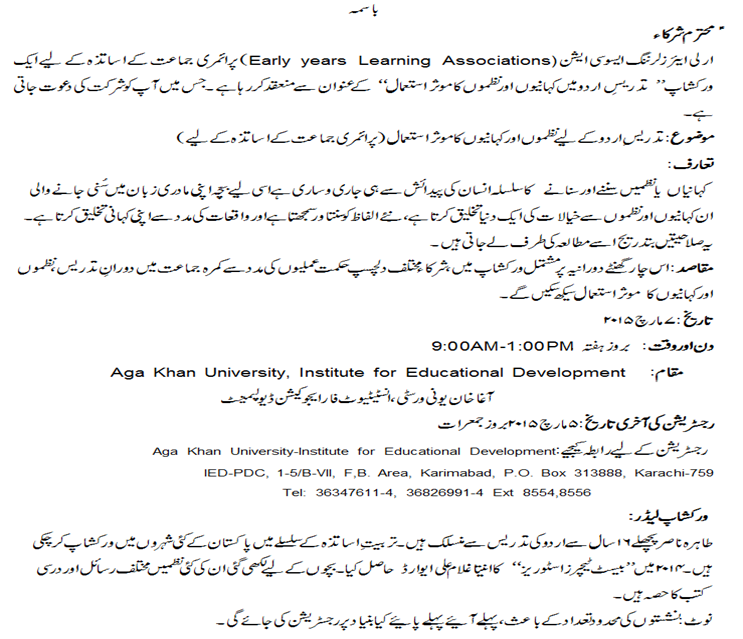 She has also done ICELT course from the Cambridge University. She has 16 years of experience in the field of education which includes teaching at University level, training teachers, and school management. She has also presented research papers at national and international level. In view of limited seats available, prior registration for this workshop is mandatory. Kindly confirm your participation latest by Thursday, March 26, 2015 at registration@ptan.org or 36826991-4 Ext. 8556/8554 (Tuesday-Friday), as this will facilitate us in organizing the session effectively. On behalf of SAP Executive Committee, we would like to invite school teachers for the academic session to be held on Saturday, March 28, 2015. Topic:"Argumentation in Science: An Art of Giving your Ideas Power"
Ms Uzma Munir, Students of MEd., AKU-IED. Kindly confirm your participation latest by Thursday, March 26, 2015 (by 12:00 noon) at registration@ptan.org or call 36826991-4 / 36347611-4 Ext. 8554 / 8556, as this will facilitate us in organizing the workshop effectively. Ø To understand what is Multiple Intelligence Theory and its importance in education. Ms. Gulzar Khalfan is a facilitator and Teacher Trainer. She is an Executive Committee member of SHADE and APEE at AKU-IED. She has done her Master in Educational Leadership from Australian Catholic University, Advanced Diploma in Human Development (Early Childhood Development) from The Aga Khan University and Master in English from NUML She was associated with AKESP, The City School and Beaconhouse School System. She currently works as a freelance trainer. In view of limited seats available, prior registration for this workshop is mandatory. Kindly confirm your participation latest by Thursday, March 25, 2015 by 12:00 noon. at registration@ptan.org or call 36347611-14 /36826991-4, Ext. 8554 /8556, as this will facilitate us in organizing the workshop effectively. · Make a conscious effort in raising awareness about core issues and basics of peace education. and tolerance among their students. · Increase inclusivity, understanding and acceptance amongst people. · Promote and celebrate diversity of people. Ms Shabnam is presently working as a Senior Lecturer in St. Joseph’s College for Women; her main areas of interest are social studies teaching, teacher education and curriculum development. She is working for British Council project for Sindh (SESSP) as a member of a team of Curriculum Developers. She is also a member of a team of textbook writers for the Sindh Textbook Board, Jamshoro and earlier worked as a member of a team of textbook writers for the Sindh Textbook Board. In view of limited seats available, prior registration for this workshop is mandatory. Kindly confirm your participation latest by Thursday, March 26, 2015 by 4:00 p.m. at registration@ptan.org or call 36826991-94/36347611-14 Ext. 8554/8556, as this will facilitate us in organising the workshop effectively. Registration will start from Friday, March 6, 2015 at 8:30 a.m. Since seating at the workshop is limited, aspiring participants must confirm their participation at registration@ptan.org or phone # 36826991-4/36347611-4 Ext. 8554/8556. Available seating will be assigned on a first-come, first-served basis, and the registration will be closed once the workshop has been fully subscribed.